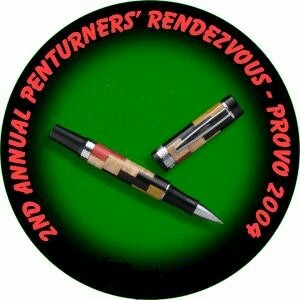 The 2nd Annual Penturners Rendezvous was held on Wednesday evening, June 9th, 2004 at the Holiday Inn in Provo, Utah. As was done last year, the gathering was held in concert with the Craft Supplies USA Open House and the Utah Woodturning Symposium. This year we had 50 plus pre-registered and many others registering at the door. The doors opened at 7PM and there was a line of people waiting patiently to get in. The evening included this year's pen display and vendor tables with Arizona Silhouette, Bethlehem Olive Woods, Kallenshaan Woods, and Legacy Mills represented. In addition to the vendors, we had a mini-lathe for demos and a lot of great mingling with fellow pen turners. Those who have never met Joe Hermann, editor of Woodturning Design, had a chance to chat with him. Lots of great fun! Lots of great people! There are many to thank for their donations, help at the event, just support in general. We'll have a listing of the prizes, the winners as we know them, and more as time goes on. Check back frequently to see the latest additions about the Legacy Mills tour, Craft Supplies Open House, the Penturners Rendezvous, the Pen Race, and the Utah Woodturning Symposium. With almost 3000 photos to sort through and many hours of web work to do, I'll get it posted as quickly as possible. On Tuesday afternoon, we had the opportunity to tour the Legacy Mill Factory. A group of 12 or so of us met at the factory and got an in depth tour of the design, testing, and manufacturing operations. You can see the photos of the tour if you were unable to attend. As has been tradition, Craft Supplies USA (the Woodturners Catalog) holds there one day open house on the day before the beginning of the Utah Woodturning Symposium. This year, Wednesday, June 9th was the day. The event features many of the demonstrators from the Symposium as well as the vendors for products that Craft Supplies offers. Again this year, the Yahoo Penturners group put on demonstrations. Rich Kleinhenz, Scott Greaves, and Kurt Hertzog, did the honors. One of the highlights of the Open House is the annual Clearance Sale. Photos of the event are posted for your enjoyment. Wednesday evening, after the Craft Supplies Open House, is the Pen Turners Rendezvous. With little time to pack up at Craft Supplies, get back to the hotel, and get the ball room setup, the event still managed to come off in a timely fashion. This year, as last, the Rendezvous was held at the Holiday Inn in Provo. This years crowd was no less enthusiastic than last years. While we scrambled to get the room setup, we had a line in the hallway waiting to get in. At 7PM, the gala started and ran until we started the prize drawings at 9. The event is documented in pictures for your enjoyment. The pen races were held on Thursday evening. There was a sign up schedule with two lathes being available from 7PM to 9PM. The 7PM starters got sidetracked with other items so we went on without them. Momentarily before the start of the first two contestants, one of the tailstock locks broke. A quick rearrangement of the plan and we did the pen races one at a time on the working lathe. We had a nice audience for the event and had four entries. The prize was a self-centering pen blank drilling vise donated by Paul Huffman. Take a look at the event and the winner. Members of the Yahoo Penturners and the Pen Makers Guild contributed pens to a group pen display. This display was at the Wednesday evening Penturners Rendezvous and then in the Instant Gallery at the Utah Woodturning Symposium. Attendees at both events were able to vote on the contents of the display. Take a look at the display and the results of the voting.